Friday morning I had an interview (yayyyy!!!!) and I was also asked to participate in an Instagram loop called Faith Share Friday! This is a loop where Christian women pose a question related to faith and other women respond and share their own stories. I had an absolute blast sharing stories of faith and reading how other wives try to embody the Proverbs 31 woman in their daily lives! I encourage you to hop on Instagram this Friday and search for #faithsharefriday to participate and connect with some awesome women of God! With all the excitement of my day, my usual at-home schedule got a little thrown off and I forgot to set something out for dinner (oops!). I was craving Mexican, however, we have YET to find a Mexican restaurant that somewhat compares to the ones in North Carolina. For some reason, the restaurants here don’t serve ACP (chicken, cheese, and rice bowl) and that is my absolute favorite Mexican dish :(. So, instead, I googled and found a Japanese restaurant that sounded good. It was called Osaka Japanese Steak House so I looked up the menu to make sure it wasn’t going to be crazy expensive since Dakota also had a “surprise” date night planned for Saturday! The menu looked amazing and decently priced so we decided on eating there. When we got there, however, we noticed that it was a Hibachi Grill where they make all the food in front of you. We also noticed the menu was not the same one I saw online but Dakota is obsessed with watching the men cook so we decided to stay anyways! The food was great and our cook was very entertaining! Saturday morning was spent cleaning the house and running errands for our special plans for that night! 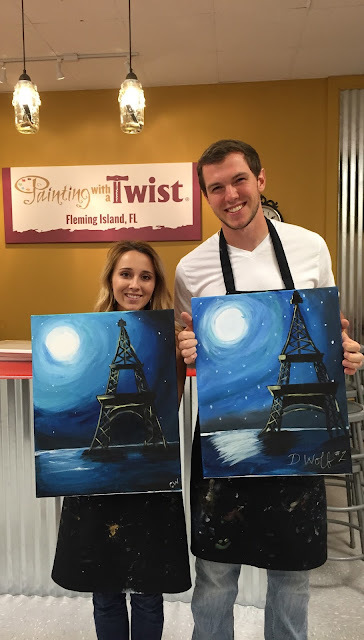 Dakota had told me the weekend before that a few ladies he worked with had gone to a “wine and design” painting studio and he thought it sounded like so much fun! So, when he told me he wanted to plan a surprise date night, I had a hunch of what we’d be doing ;). He gave away the second surprise when a few nights before I said, “hey, we haven’t hung out with Taylor and Chris in a while. Let’s go do something with them soon.” Dakota immediately got his goofy “I can’t keep a secret” smile and knew that he had planned for Saturday to be a double date! Once the cat was out of the bag, I suggested Taylor and Chris come over before going to paint for a homemade dinner. I’m a frumpy cook, however, there are a few dishes I can make pretty well! So, we made a Caesar salad, baked ziti, and garlic bread for our little date night! 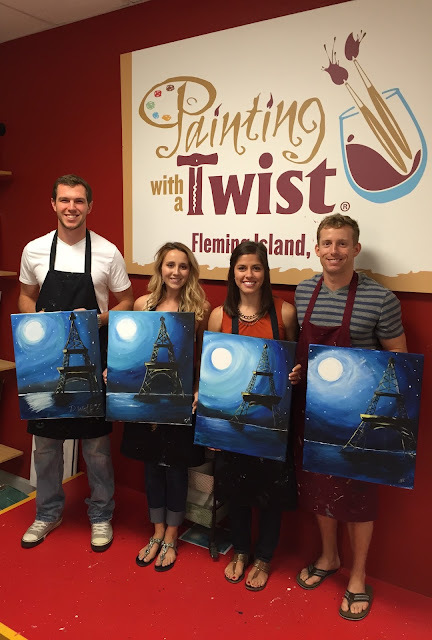 After enjoying dinner, we headed to the painting studio for our night out! Once we got there, we got fitted in our smocks, poured some white wine, and waited for our class to begin. If you have never been to a place like this, I would highly suggest trying it out! We had SO much fun! I am a very bad painter to say the least but the instructor made it enjoyable and easy to follow along. We all walked away very satisfied with our paintings and had a great night overall! Sunday morning was spent like every other in the Wolf Household. On Sundays, we love to just lay around and enjoy a lazy day together before going to church in the evening! This particular morning, Dakota made me the yummiest French toast and I was one happy wifey! After cat napping and watching Netflix all day long, we got ready and headed to Celebration Church for the Sub 30 service! 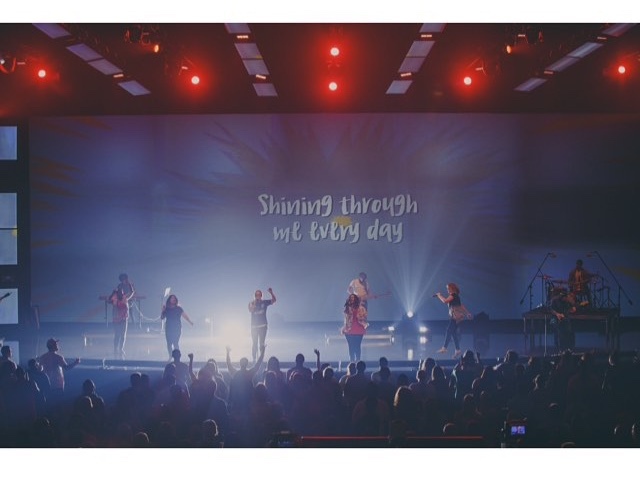 We love this service because it is designed and implemented for young adults under the age of 30. We think this is perfect for us because every message is relevant specifically to our generation! I also LOVE to jam out to some worship music and this band always speaks right to my heart! I hope you too had a great weekend filled with Jesus and fun times! Have a wonderful Monday!